Having worked and lived across Britain and the Unites States for just over 27 years, I have moved between England and Scotland, from the East Coast to the Midwest, while I was never inclined to regard myself as an emigrant, and less so as a migrant or immigrant. Yet, as time passed by and I came to terms with my lifestyle and professional trajectory, I have come to realise that in effect, I am defined by all three. Indeed, I am an emigrant who left my place of birth and upbringing, a migrant who moves across several cities and countries, and the immigrant who continues to integrate in this cosmopolitan existence. The recognition of one's migrant existence does not come naturally to everyone. Unlike many friends and relatives who have intently set out to emigrate, I never saw myself instantly as the quintessential Maltese emigrant whose figure in our imagination is somehow fixed and often distorted. Nor does this realisation ever come as an epiphany. Rather, it is a feeling that evolves and defines itself differently, and which more than anything else, it comes from a mix of nostalgia and continuous optimism. Yet, there was a moment when my migrant existence became very clear when, back in 2007 I first met John Portelli at my home in New York City where he was visiting. Then I knew of John's prominence as Professor of Education at OISE in Toronto University. It is also curious how, when I first met John, being both professors of education, I thought we will be mostly engaged in academic stuff. However, the first thing he asked me was to read his poetic work and honoured me with a request to translate a number of his poems in English. Subsequently he published these poems in his bi-lingual book Taħt iċ-Ċirasa/Under The Cherry tree (2008), then his second book of poetry after Bejn Żewġ Dinjiet/In Between, published in 2003. In his poetry, Portelli’s migrant existence verges on being a philosophical treatise. This is particularly felt in his latest book Xewqat tal-Passa/Migrant Desires (Horizons 2017), which I am here discussing and presenting to an audience that is perhaps more used to my political commentary. I am not diminishing anything from the skilful poetic form by which he engages his mother tongue when I say that Portelli's poetry is an object lesson in the narrative of a migrant existence. By this I do not mean a nostalgic set of poems about his native land (as found in cases where emigrants use poetry to pine for their homeland). Rather, Portelli's work is testimony to a cosmopolitan existence where his poetry takes on such a character in how it remains a migrant art-form. Portelli shows how, having left one's country (as an emigrant) to stay in another (as an immigrant), one’s life is characterised by a wider and often permanent sense of movement (as a migrant). This takes a hybrid meaning of displacement and belonging. It is an awareness of otherness that is also directed inward. In so many ways it is neither positive nor negative. It moves beyond such distinctions as it embraces a reality which some would simply dismiss as contradictory, but which, if embraced by all, the world will be far better than it ever has been. What is made for him is the fact that even when wrathful, the old briny dark waters which terrified Homer and haunted Montale, also underpin the plural nature of one’s migrant existence. In his poem Mal-Lodos - the lodos being a strong south-westerly wind known to hit the Aegean and the Marmara seas - Portelli recalls how: “Gunayden [good morning], | they call me | they think I am a Turk. | Merħaba. Then you must be an Arab.” (p. 102). He feels the contradictions that his cosmopolitan existence brings with it, whether he is away from his homes, or as he returns to one of them - in this case, Malta. There he finds that while, in his youth, the call for colonialists to leave (“British go home!”) signified a call for liberation from being hated as others, now it seems that the hatred of the other is reversed: “Today | With Canadian friends | I visit Malta of the EU and read | in shame and rage on rubble walls | “Africans go home”. Far from poetic hubris, or what some often misconstrue as the emigrant returning to complain about his native country, Portelli does the opposite with Malta. His love of a wider world is not an easy departure from wherever he happens to be, whether his native Malta or his adoptive Canada. One could sense a strong provocation in Portelli’s words. This is not simply coming from what one regards as one’s own origin and repose, but from that which characterizes one’s origin as “clandestine”. The Maltese original is “fejn ibaħħru il-klandestini” which in Portelli’s poetry is not construed as a criticism of those who come “illegally”, but refers to the clandestine nature of the same migrant existence that gives one the ability to grasp the world beyond the barriers that others claim to defend all too hastily. In other words, as cosmopolitans, we are all klandestini. 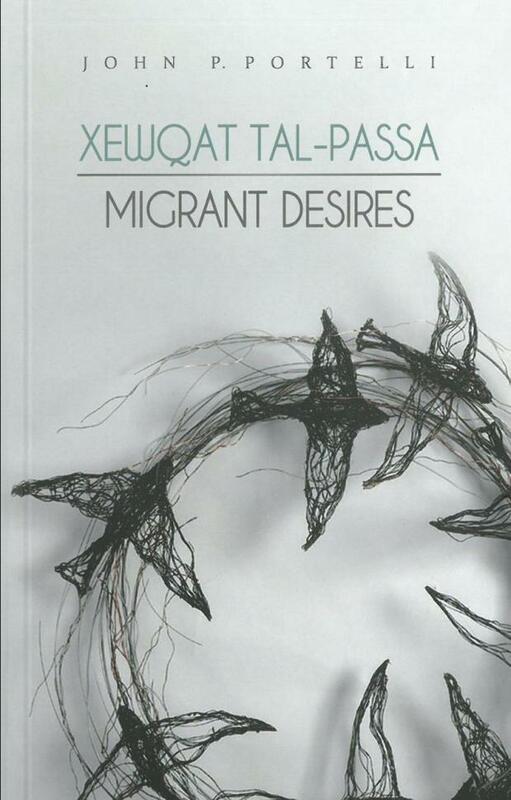 In so many ways, Portelli's Xewqat tal-Passa is a manifesto of the migrant self to which many would hastily deny any belonging. It elegantly moves beyond the annoyingly boring arguments that continue to veil anti-immigrant hatred. Portelli’s poetry renders such hatred irrelevant by rejecting the tracks on which they run. Instead, his poetry takes on the fundamentals of existence as being intrinsically migrant, even when one may never have left one’s homeland.